Speculated by some scholars of the Legion to be an evolved version of the common felguard, Fel Lords serve as enforcers in the direct service of Archimonde. Their cruelty is matched only by their brute force. Zakuun was set to a task that called upon both of these traits in equal measure: breaking the iron will of a stubborn and defiant orc chieftain of the Warsong Clan. . . .
/rw Tanks use Defensve CD when boss is disarmed and when enraged (30%). The boss will fight the players with a big axe. After some time he will throw the axe away and does spells while his axe does aoe dmg. At the end of the fight, the boss gets pissed and enrages, giving him all the powers, no matter if he has he weapon or not. This fight is divided in 3 phases in which phase 1 and 2 will all the time. But on all phases, the boss has 3 abilities that are the same during the entire fight. Melee behind boss spread around him on max melee dps range. Tank the boss in the middle of the platform. Tanks on top of each other closest to boss. Tank boss were he stands from start. Ranged stay spread, leave left side free. Tank inside shadow realm, dodge the mechanics until you are out. Move boss away from Fel Crystals if they appear near you. Use defensives on disarmed phase and enraged phase when boss does heavy handed. Move to a rumbling when it appears. This debuff is good and bad. The good thing is that players get boosted dps and haste. The bad thing is that it can be deadly when players come in to contact with following things. Wake of destruction shadow waves that explode if it touches a player, doing high aoe (3y) dmg. Ring of destruction is a ring that expands outwards doing shadow dmg. You can jump over this ring to avoid it. The destructive foe triggers an explosion. The boss creates a Rumbling on the ground randomly. After some seconds it will turn in to a big Fel Crystal that does dmg to all players every 3 seconds and medium dmg every second on players that are near it. So except for the abilities above, the boss has following abilities when holding his weapon. This is the debuff and tank swap ability. Disembodied; sends the tank to the shadow realm. When reentering the normal realm, a shadow energy is left behind every time. This shadow energy does wake- or ring of destruction inside the shadow realm. The tank gets a debuff which increase shadow dmg taken by 100% for 1.5 minutes. This can be deadly when there are loads of shadow energies in the shadow realm that the tank has to pass to exit it. So, tanks need to dodge the wake and ring of destructions very good inside the shadow realm. The boss sends out Wakes of Destruction at random enemies with his axe. The boss puts this debuff on a player and when this player is healed it gets absorbed instead. After certain amount of healing the absorption explodes and does high aoe dmg 6y. The boss throws his axe on a target location. This axe does raid damage by causing Fel explosions. During this phase the boss has 30% haste. This phase ends after 30 seconds. The axe does low/moderate raid damage every 3 seconds for 20 seconds. Healing dependent. Healers need to do some heavy raid healing for 30s. All attacks the boss does strikes the nearest player. If no player is near, the tank gets hit again. Tanks need to stand on each other close to boss and use defensive CD. The boss targets some players which after 5s they will detonate 8 Wakes of Destructions. If u are targeted, run to the left side of the room spread from each other. The boss Fel Lord enrages. The axe does aoe dmg (Fel Explosions) while the boss holds it. This phase is a tank prio phase. The boss is Heavily Armed and strikes the nearest player with the same amount as on main tank. Tanks need to be on top each other and closest to boss. Tanks need to use defensive CDs. Healers need to use defensive CD on tanks. Healers need to heal 2 tanks at the same time as main tanks. Blood lust/Time warp on this phase. 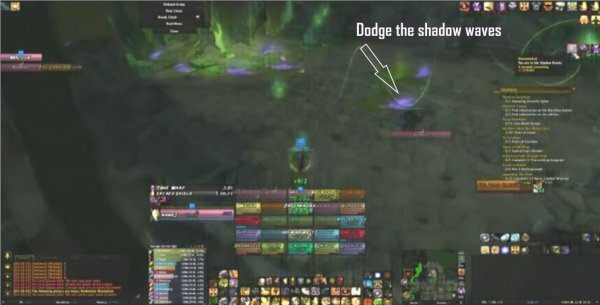 Every time a tank gets hit by Soul Cleave, the player enters the Shadow Realm. This realm is all about surviving for a short time. Dodge the wake of destruction and Ring of destruction in there. Every time a tank enters this realm, there will be more mechanics to dodge. The tank has increased shadow dmg taken, so it´s important to dodge the mechanics in here.